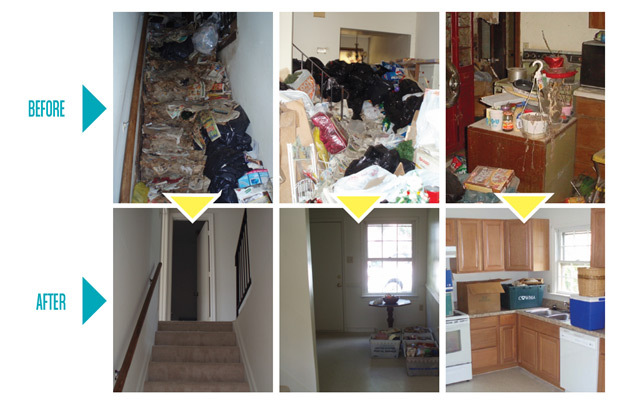 ServiceMaster by JTS knows how to successfully handle hoarding or extreme cleaning. When you call us, you can expect an honest, realistic approach paired with skills that can only come from special training and a 60 year history of cleaning. Don’t be embarrassed if you find yourself, a family member or a friend dealing with a hoarding situation. Compulsive hoarding is a complex anxiety disorder that can make it difficult for someone to part with or discard possessions regardless of value. A home that has been affected by hoarding can be unhealthy, dangerous or both. Dramatic action is needed to address the problem and help the customer start the road to recovery. This requires experts who can navigate the issues as well as people who treat the customer like family. To have an understanding, professional approach to solving a serious problem ServiceMaster by JTS is your trusted choice. We work with Matt Paxton, host of the hit TV show Hoarders and the founder of Clutter Cleaner, a nationally recognized extreme cleaning company to train and get the experience necessary to resolve hoarding situations, both large and small, in the Longview area. Call ServiceMaster by JTS today to talk to an expert who can create a customized plan for you. Our goal is to keep the home clean. Because of this we make the effort to fully understand the problem before proceeding. We work with the family and individual to make sure everyone is on board, always keeping the customer in charge. This may include reference to a local therapist or social services. We build trust over time and show our customer full respect. We develop a restoration plan that serves as a roadmap to the entire cleanout. We help reorganize spaces and remaining possessions. We handle all the details including donation, recycling, and disposal of unwanted items and help families sanitize and display kept items in the home. We can also sort, document and help deliver donated items to the customer’s selected nonprofit organization. We ensure that the individual and family create a plan to keep and maintain a clean home. We also provide short-term phone follow-up to see if the home is being maintained or if additional help is needed. Whether we’re working with family members, a therapist, or the customer, we bring invaluable insight that will help the entire process go smoothly and successfully, with the customer always in control. For hoarding and estate cleanup in the Longview area, call ServiceMaster by JTS today.